SmartPoints® FYI! Recipe values won't always match up with the SmartPoints® calculator. Just like Weight Watchers, in recipes, we don't factor in the calories, sugar, etc., from fruits and veggies with a SmartPoints® value of 0. (Blended beverages are the exception.) Click here for the full 411! 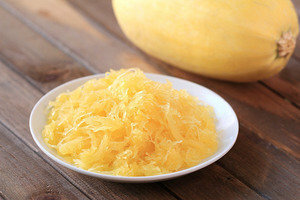 Why spaghetti squash? A cup of the magical stuff has a mere 42 calories and 10g carbs (SmartPoints® value 0*). The same amount of regular cooked spaghetti has around 200 calories and 40g carbs (SmartPoints® value 5*). The squash is also packed with filling fiber, plus loads of good-for-you vitamins. No contest! In a slow cooker: Place whole squash in a slow cooker with 1/2 cup water. Cover and cook on high for 2 1/2 hours, or until soft. Slice squash in half lengthwise; scoop out and discard seeds. In a microwave: Microwave squash for 6 minutes, or until soft enough to cut. Once cool enough to handle, halve lengthwise; scoop out and discard seeds. Place one half in an extra-large microwave-safe bowl, cut side down. Add 1/4 cup water. Cover and cook for 7 minutes, or until soft. Repeat with remaining half. In an oven: Preheat oven to 400 degrees. Microwave squash for 6 minutes, or until soft enough to cut. Once cool enough to handle, halve lengthwise; scoop out and discard seeds. Fill a large baking pan with 1/2 inch water, and place squash halves in the pan, cut sides down. Bake until tender, about 40 minutes. In a large bowl, combine crushed tomatoes, tomato paste, Parm, vodka, vinegar, and seasonings. Mix well. Bring a large skillet sprayed with nonstick spray to medium-high heat. Add frozen peas and 2 tbsp. water. Cover and cook for 3 minutes, or until thawed. Add onion. Cook and stir until veggies have softened and lightly browned, about 5 minutes. Reduce heat to medium-low. Carefully add tomato mixture to the skillet. Cook and stir until hot and well mixed, about 3 minutes. Remove from heat, and add cream cheese. Stir until smooth and uniform. Cover to keep warm. If needed, reheat squash. Top with sauce and basil. 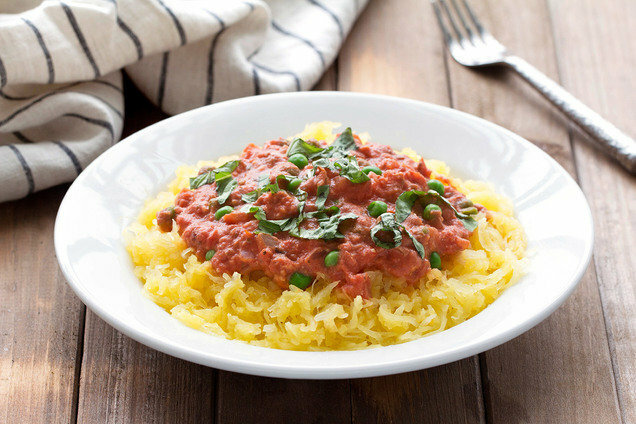 Hungry for More Spaghetti Squash Recipes? Happy National Popcorn Day, January 19th. Popcorn makes a great high-volume snack... as long as it's not loaded with butter or oil! Click here for our top reduced-fat picks and recipes. Can't you hear your pals saying "recipe, please!" once you tell them about this? Click "Send to a Friend" now.